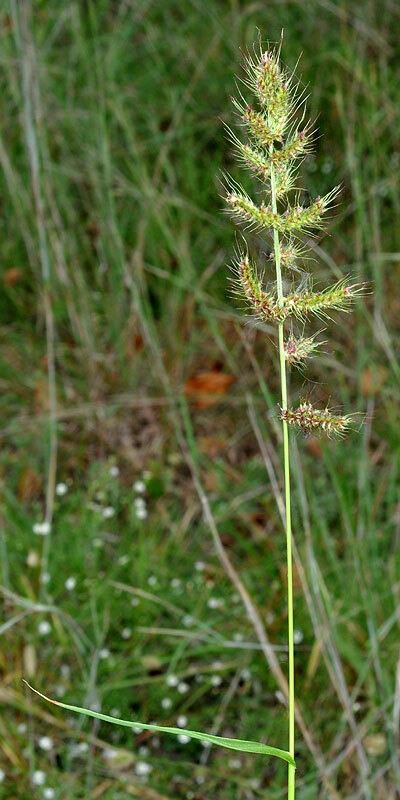 Echinochloa muricata inflorescence. David G. Smith. Delaware Wildflowers. delawarewildflowers.org (Accessed 4/2018). Echinochloa muricata is an annual, presumably C4 metabolism (Charest and Potvin, 1993), branched from base, to over 1 m tall, stems often stout, to 1 cm wide at base, often streaked with dark red; sheaths compressed, smooth. 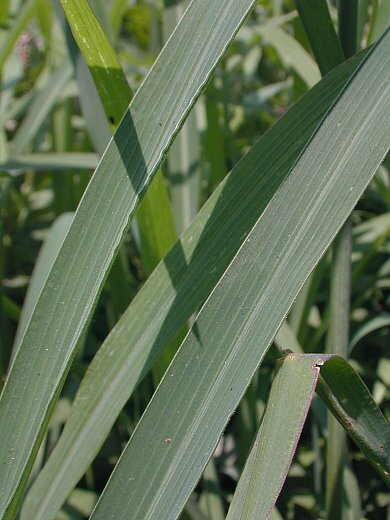 Echinochloa muricata leaf. Copyright © 2002-2017 by John Hilty. Illinois Wildflowers. illinoiswildflowers.info (Accessed 4/2018). Echinochloa muricata spike. David G. Smith. Delaware Wildflowers. delawarewildflowers.org (Accessed 4/2018). 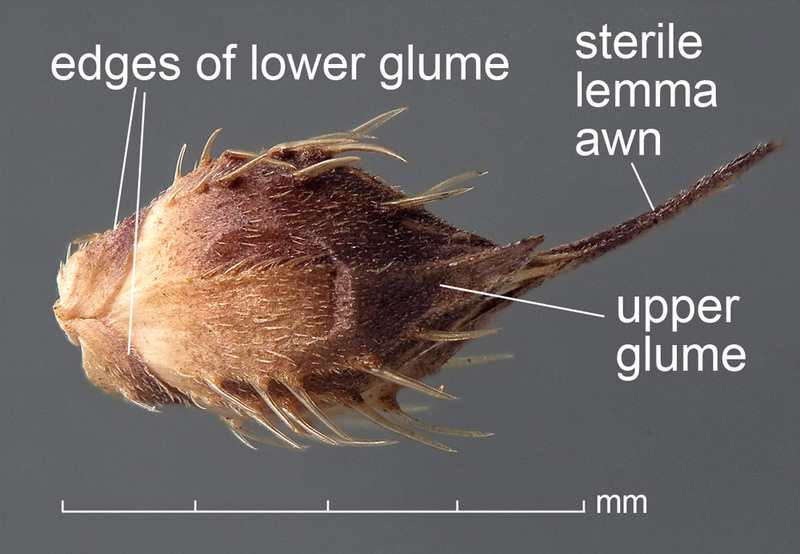 Flower spikelets dark purplish, second glume and sterile lemma with broad-based hairs, lemma tip pointed, persistent; inflorescence to 30 cm long, of well separated spikes, 2-3 cm apart, 3-6 cm long, densely flowered, appear coarsely hairy, often dark purple; blooms and fruits June-Nov.
Fruit dry, one-seeded.Seeds eaten by many waterfowl and songbirds (Martin et al. 1951). 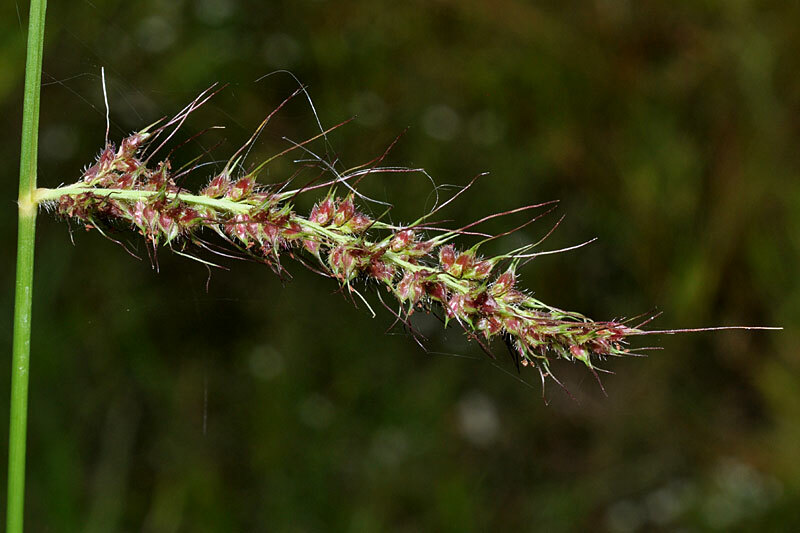 Echinochloa muricata spikelet. photo by D. Walters & C. Southwick. Identification Tool to Weed Disseminules. idtools.org/id/table_grape/weed-tool. idtools.org (Accessed 4/2018). Habitat: Wet, open ground or shallow water of roadside ditches (see E. crusgalli). Notes: Plants eaten by rabbits and muskrats (Martin et al. 1951).